I'm live from Busan writing my first post on my trip this time. It's over 2am here but I decided I have to start writing soonest possible so that I captured every moment I can remember of the places I'll be talking about. First up, is Gwangan Bridge and Gwanggali Beach. My trip this time started in Busan. I'll be here for 3 days before I'm off to Seoul. Going with friends who have not been to Korea, of course I had to mix in familiar places with the non-familiar places to me. I've only spent 1 night in Busan on my trip last year so there's a lot of first time places for me here. One of the first places I went to see is the Gwangan Bridge also known as Diamond Bridge. This place is nice to visit at night as you can see the bridge being lit up by bright lights. 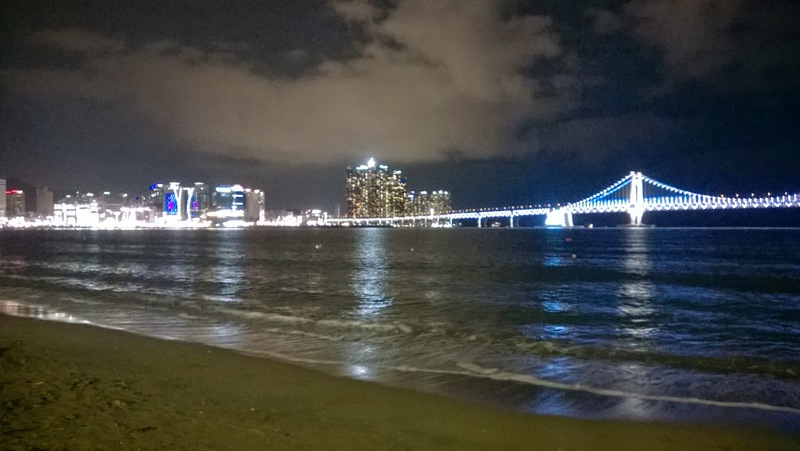 To have a nice view of the bridge, you should view it from Gwangalli Beach. The best time to visit is when they have the Fireworks Festival going on in Busan. Unfortunately, I missed that. How to get to Gwanggali Beach? Easy. Using the Busan Metro, on Line 2 head to Geumyeonsan station for the nearest to the beach. I saw a lot of articles on the web saying to get off at Gwangan station but that station is a bit further from the beach. From Geumyeonsan station, head out exit 3 and walk straight downhill all the way to the beach. You'll be at the southern end of the beach, which would be a great starting point to walk along the beach and the nearby Cafe Street. Cafe Street is lined with the many local and international cafe franchises. You'll be spoilt for choice. All along the stretch of the beach, you'll be treated to the view of the Gwangan Bridge. There's even a part of the cable used for the bridge displayed at one part of the beach boardwalk. The temperature right now over here is quite perfect. There's a little bit of wind and the cool breeze makes it easy to walk all the way to the other end of the beach. To experience riding on the Gwangan Bridge itself, you can opt for a taxi ride or even the Busan City Tour Bus. The first time I went to Busan last year, I arrived from Gimhae airport and took a taxi to my hotel at Haeundae. It definitely used the Gwangan Bridge to get to Haeundae fast. The experience, is of course awe inspiring.